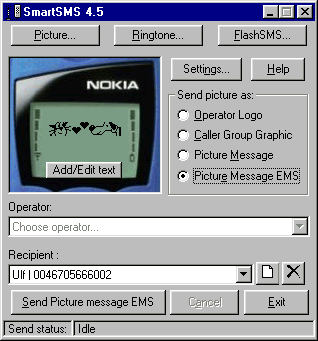 Enables you to send Picture Message, logos, caller group graphic and ring tones to your Nokia phone. You don't need a cable or infrared connection. SmartSMS sends the ring tone, logo, or graphic as an ordinary SMS (small messaging system), so you only need a modem and a dial-up SMSC (SMS server) that supports the UCP protocol. SmartSMS now has support for FlashSMS and the ability to send via TCP/IP.